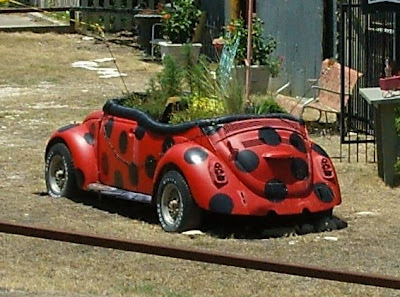 Jim over at Terrell Daily Photo had one last month of an old VW Beetle that had been turned into a planter and painted like a lady bug! Here's a small shot, but you click over to Jim's site for a better photo! These remind me of my father-in-laws place in rural Missouri. I think he has every car he has ever owned in the front yard! Have you seen the VW at the Dallas Arboretum? It is covered in flowers. 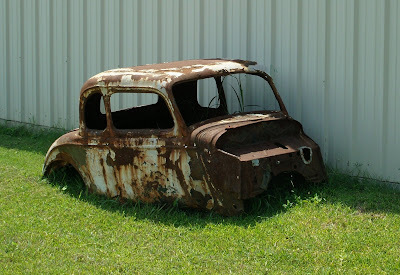 Not sure what make the rusted car is but it's definitely not a Model T or A. It looks to be from 1932 to 1935. I love the bug! So cute. I haven't seen McCain around town, but I guess he's probably keeping out of the rain. I wonder where he's staying, all the hotels are fully booked with evacuees. No room at the inn for Mr. Senator.